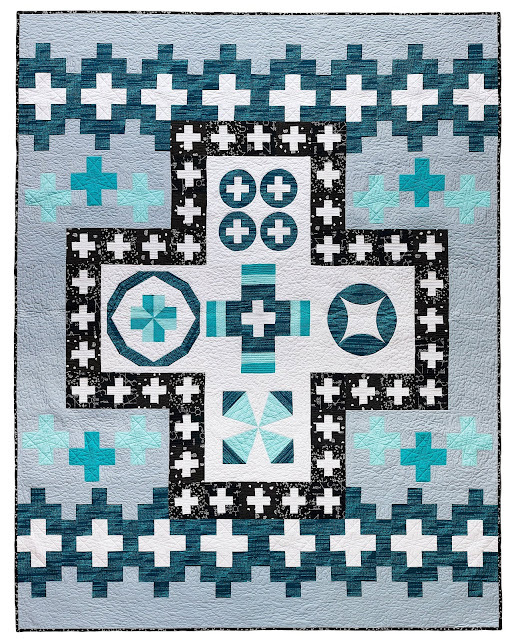 I am so excited that the Modern Plus Sampler has officially begun and I am looking forward to seeing all of the wonderful fabric combinations on the Facebook Group and on Instagram (#ModernPlusSamplerQuilt). 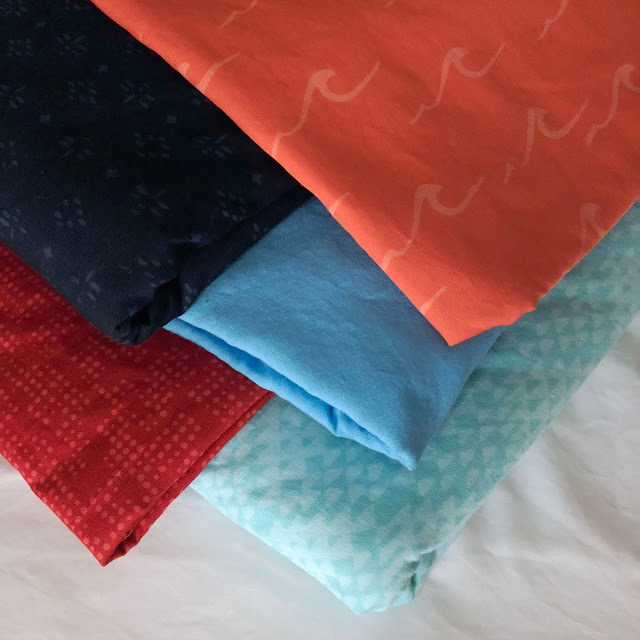 You can find the fabric requirements here and here (and all of the Modern Plus Sampler information and posts can be found here). We are just getting started, I hope you decide to join in! For the version of the sampler I am making along with everyone, I am using some Me + You batik fabrics from Hoffman Fabrics. I fell in love with the vibrant colors and Aaron Hoffman was super nice to send me some to play with! I am actually still figuring out where I am going to use each fabric. 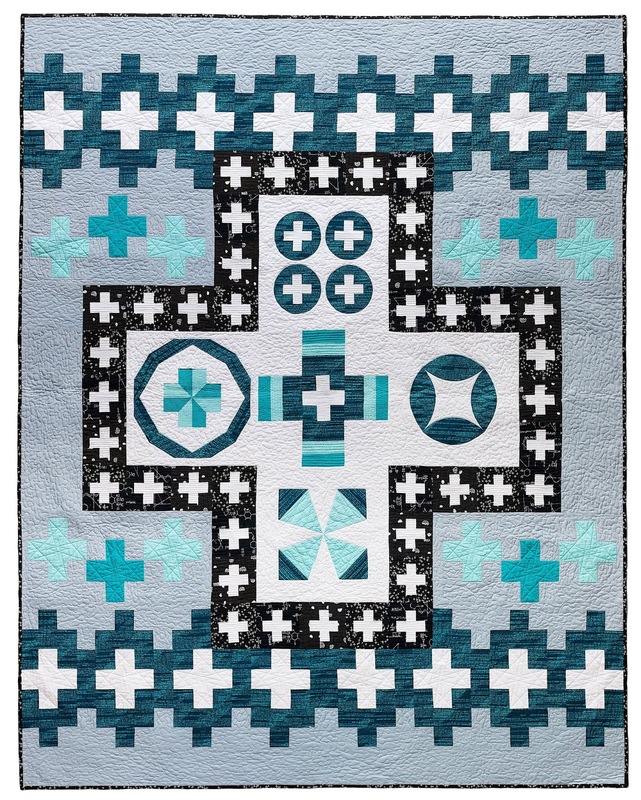 My original thought was to use the dark blue for the plus signs that form the large plus sign (Fabric C), but I am thinking of instead possibly using the red. What do you think? For my test version of the sampler I used the fabric below. I wound up using more of fabric B than listed because I did not have much of fabric F and I really just loved that text print. Great fabrics. I know I'd have to play around with the colors to decide, but having the large plus be red seems like it would be really vibrant and fun. Yes, the red would be great, but the navy is also. decisions decisions... I am still deciding on my fabrics. I just settled on my last two fabrics for my version. My large plus is going to be Navy. Nice colors, Cheryl. It depends on what you pick for fabric A. I'd go for A = ice blue and C = red or A = canyon and C= navy. I've picked my fabric for A, C and D from my stash. The others will be a scrappy mix of related colors. good choice! the red would give an interesting effect! I really like your selection. Lovely colours and prints. I think red will pop, make it vibrant, but will also grab a lot of the attention. Navy Blue will act as a frame for the inner designs. I like the idea of red in the plus signs! Either way, the Hoffman batiks will be beautiful in any position! Very bold and bright fabric selection. I have my fabrics chosen, but waiting on two Kona colours from my LQS (I didn't have enough). Great colors. The red and orange are really going to shine!